Mark Allen recently posted on the GEG UK G+ Community asking if there was a better Google Calendar widget for new Google Sites. 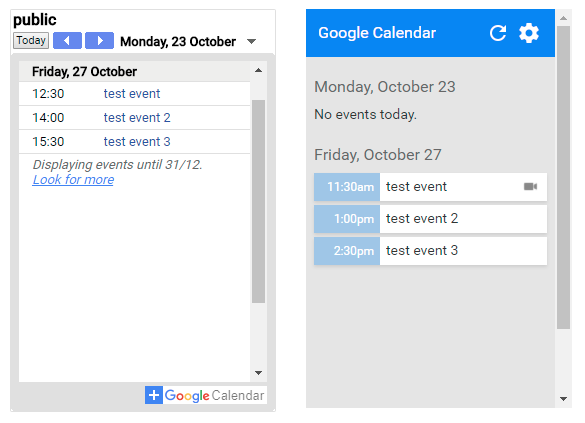 If you missed it Google Calendar recently had a UI overhaul but this hasn’t yet been applied to the embeddable version which gets used as the calendar option in new Google Sites. In his post Mark highlighted the Google Calendar Chrome Extension made by Google, which does have a light Material Design look about it. The source code for the extension is available on Github and I was interested to find out if there was a magic Google url they were embedding the calendar with or if the calendar was locally styled by the extension. Looking through the code it was quickly apparent that the extension was making calls to the Google Calendar API and then styling the results. If you’d like to deploy your own version of this you can copy this script file and follow the setup. Porting a Chrome Extension to Apps Script is feasible, one headache is when developing Chrome Extensions there are a number of different APIs you can call for things like authentication, storage and sending messages. Rather than commenting these out I created this basic shim that either handled these in an Apps Script way or just did nothing gracefully. Chrome Extensions can handle internationalization (i18n) well and rather than removing this from the Apps Script project I copied the i18n EN JSON object into the project and provided a method for getMessage. One place I used this was storing options in localStorage client side and Properties service Server side in a script file that was used server and client side. Because Google Apps Script server calls execute asynchronously this is currently a bit of a mess and I’m sure can be refactored. In your copy click Resources > Advanced Google Services and switch Calendar API ‘on’. In the same dialog window click ‘Google API console‘ and in the console click ‘Enable APIs and Services‘ and search and enable the Calendar API. Open the Sites page where you’d like to add the web app. Once setup the script owner can click on the settings cog in the widget to select which calendars are displayed.